Rather than recapitulating everything that I said in my earlier review of the first Lyonesse book, Suldrun's Garden, this review of Jack Vance's latter two volumes in his Lyonesse trilogy, The Green Pearl and Madouc, will be much briefer. For those who haven't yet read the above-linked review, it would behoove you to do so now, as I discussed there the origins of the Lyonesse legends as well as certain qualities in Vance's prose that appealed to me. In achieving her aims, Desmëi used a variety of stuff: salt from the sea, soil from the summit of Mount Khambaste in Ethiopia, exudations and pastes, as well as elements of her personal substance. So she created a pair of wonderful beings: exemplars of all the graces and beauties. The woman was Melancthe; the man was Faude Carfilhiot. Still all was not done. As the two stood naked and mindless in the workroom, the dross remaining in the vat yielded a rank green vapor. After a startled breath, Melancthe shrank back and spat the taste from her mouth. Carfilhiot, however, found the reek to his liking and inhaled it with all avidity. Some years later, the castle Tintzin Fyral fell to the armies of Troicinet. Carfilhiot was captured and hanged from a grotesquely high gibbet, in order to send an unmistakably significant image toward both Tamurello at Faroli to the east and to King Casmir of Lyonesse, to the south. As was in the case with Suldrun's Garden, Vance splits the narrative into several subplots, each of which is largely independent of the others, although there is some convergence toward the end. Aillas continues his adventures in opposing Casmir, although at times he finds himself on the wrong side of a quarrel, especially with the sometimes-comic clashes with the fiercely xenophobic Ska. Casmir continues in his quest to avoid the dire prophecy about his grandson via his dead daughter Suldrun overthrowing him. As he seeks answers to what happened the night that Suldrun gave birth, he learns that the Princess Madouc is actually a changeling, leaving him to worry ever anew about the future threat. Vance mixes the serious and the whimsical adroitly here. He sets the stage well for the adventures of each of his protagonists and while at times the action may verge on becoming too droll, he usually returns to the more dour side of this tale before things become tedious to read. Often the legends surrounding Lyonesse, Ys, and the sunken lands would contain a mixture of the comic and the tragic, in order to make each more effective. Too often, modern adapters of these settings would emphasize too much of one at the expense of the other, but Vance manages to find a good balance of both here in The Green Pearl. Casmir slowly drew back. He looked down at Madouc. "Why did you throw fruit at Lady Desdea?" Madouc said artlessly: "It was because Lady Desdea came past first, before Lady Marmone." "That is not relevant to to the issue!" snapped King Casmir. "At this moment Lady Desdea believes that I pelted her with bad fruit." Madouc nodded soberly. "It may be all for the best. She will take the reprimand more seriously than if it came mysteriously, as if from nowhere." "Indeed? And what are her faults, that she deserves such a bitter reproach?" Madouc looked up in wonder, her eyes wide and blue. "In the main, Sire, she is tiresome beyond endurance and drones on forever. At the same time, she is sharp as a fox, and sees around corners. Also, if you can believe it, she insists that I learn to sew a fine seam!" "Bah!" muttered Casmir, already bored with the subject. "Your conduct is in clear need of correction. You must throw no more fruit!" Madouc scowled and shrugged. "Fruit is nice than other stuffs. I well believe that Lady Desdea would prefer fruit." "Throw no other stuffs either. A royal princess expresses displeasure more graciously." Madouc considered a moment. "What if these stuffs should fall of their own weight?" "You must allow no substances, either vile, or hurtful, or noxious, or of any sort whatever, to fall, or depart from your control, toward Lady Desdea. In short, desist from these activities!" Madouc makes the concluding volume much more of a romp than either of the previous two volumes. Her willful nature contrasts with the meek despondency of Suldrun and her ability to confound and frustrate King Casmir's machinations plays an important role in this novel. In short, Madouc is an almost total reversal in tone from Suldrun's Garden; as the comic wit of the characters, especially Madouc and Shimrod, come to dominate the tone and flow of the story. The various subplots, mostly independent until now, begin to weave together, until finally the prophecy regarding Dhrun and Casmir is played out in a fashion that is both expected and surprising in some of the manners of its execution. 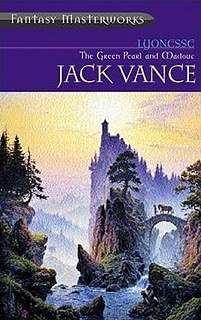 As a whole, the three Lyonesse volumes were a delight to read; easily my favorite of Vance's work. In turns witty, tragic, and almost always full of a vitality of character and setting that most fantasists fail to achieve, these three volumes are more than worthy of being called "Fantasy Masterworks." They are exemplary models of how to meld myth, tradition, and imagination together into a fascinating story that deserves to be read and re-read several times. Easily one of the best "high fantasies" that I have read in quite some time.